1. Living Proof Christmas Pictures. Have I mentioned how awful our Christmas pictures were last year? They were beyond hideous. The weather was so humid in Houston that not even photo-shop could cover the multitude of our hair sins. Well, this year we were determined to have better results. All was going well until my Mom looked at me half-way through and said, in front of everyone, “Melissa, check your barn-door.” This was my Mom’s archaic way of telling me that my zipper was wide open. Yes, apparently, my fly had been open throughout the entire first half of the photo-shoot. So much for earning respect from my fellow LPM staff! 2. Seeing a true Autumn season for the first time in my life. I walked around my neighborhood in Atlanta last weekend with tears in my eyes. The trees were raining leaves in all kinds of glorious colors. I will ponder that moment in my heart for as long as I live, a moment when I was content with merely having a set of eyes to see the beauty of God’s creation. 3. Reading Simply Christian: Why Christianity Makes Sense by N.T. Wright. What a great and refreshing read. Here is just one quote I love, “the Bible isn’t simply a repository of true information about God, Jesus, and the hope of the world. It is, rather, part of the means by which, in the power of the Spirit, the living God rescues his people and his world, and takes them forward on the journey toward his new creation, and makes us agents of that new creation even as we travel” (191). Just a glimpse into this wonderful book. 4. The Siesta Fiesta in San Antonio still makes the list! Not only did I have such a wonderful time seeing many of you in the flesh, but I am still pondering the profound implications that the theme of inheritance has for us as the covenant people of God. I have a feeling that we have barely scratched the surface of that one. What a great time of fellowship, worship, and the Word! 5. Walking into my home in Atlanta last week to find an embarrassing display of flowers and a new sweater from Colin Fitzpatrick. The best part was that it was completely unexpected. I mean, we weren’t in a fight or anything! I never knew that a little bouquet of flowers could mean so much. I’m learning more and more that little thoughtful things make the big things in marriage a whole lot smoother. I love my husband madly and I’ve had so much fun settling down into ‘normal’ life with him. 6. Auditing a Hebrew Reading class. We have translated Deuteronomy, some of the Psalms, and are scheduled to translate some of 1&2 Kings for next week. That is a whole lot of Hebrew, let me tell you! It has been so fun to be back in the formal classroom. My strength as a Biblical Research Assistant would be greatly diminished if I did not keep up with my Hebrew and Greek reading skills. 7. Driving to Macon, Georgia to visit our very own Georgia Jan. She is even more charming in person than she is in blog-world. We ate at a quaint little French-country restaurant called “The Back-Burner.” If you live near there, I strongly recommend it. Georgia Jan is my kind of woman- she can cook and talk some Scripture. A rare woman, indeed. Choose any passage (about 5-9 verses) of interest, preferably a passage that you are not overly familiar with. Read the passage several times, at least twice out loud. What book of the Bible is your passage in? Who is the author? Who are the Recipients? What is the occasion and genre of the book? Compare your original Bible translation (whether it is NIV, NASB, etc.) to other translations- use at least three or four translations. Make note of the significant changes/differences in a chart or some other helpful way. If there is a word that sticks out to you in your original Bible translation, use a concordance to do a word study on that word. What is the Hebrew or Greek word that your English translation is rendering? Where else is it used? Are there any topics/places/concepts in your passage that are unfamiliar to you? Use a Bible Dictionary to look up unfamiliar concepts and to answer general questions. After you have done as much of the leg-work as you know how or have time to do, then consult one or two solid commentaries on your passage. 9. Making the entire Thanksgiving menu in Mid-October for our next-door neighbors. I made my very first Turkey! I labored for two days straight. I stuffed it with fresh sage and quartered onions and all kinds of stuff. I also made two different kinds of stuffings, a traditional cornbread stuffing and an apple-rye stuffing. Both were divine. Did I mention that my husband has gained ten pounds since we got married? Blush. I’m so proud. Enough talk about me, though, what the heck have y’all been up to? What have been the highlights of Fall 2008 for YOU? So please, de-lurk and tell me how you are, if only for the sake of proper social reciprocity! This entry was posted on Saturday, November 15th, 2008 at 1:41 am	and is filed under Melissa. You can follow any responses to this entry through the RSS 2.0 feed. You can leave a response, or trackback from your own site. You said â€œde-lurkâ€. Way to go! Youâ€™re totally cool! Okay Fall 2008 highlights. This means September through November correct? OMG! Iâ€™m so jealous of the beautiful foliage you get to enjoy. I miss the fall in Connecticut. When I went to college in West Virginia it was amazing! No words to describe it. I never wanted to be outside so much! It was like living in a beautiful painting. Okayokayokayokay. Fall Highlights. 1. Yesterday my husband and I enjoyed the Renaissance Festival. So fun! Some of the rides and foods we enjoy every year makes life worth living. 2. Went on a business trip to Midland, TX and met this girl that is just like me! I never thought Iâ€™d every find friends that I could relate to! The Lord blessed me with Kate: Smart, beautiful, loves the Lord, brilliant, kinda dyslexic in some ways (just like me! ), we are both married with no children, we have dogs that we just love to pieces, and we love to write and are computer savvy. Oh! The Lord is good and his mercies endureth forever! 3. Hurricane Ike brought our little neighborhood together and my husband made me again believe in the goodness and heart of people. 4. We turned on the fireplace last night and it was so cozy and sweet! 5. My little Sahsha-baby-girl (my doggy) plays little fun games with me and makes me laugh laugh laugh. She came to a picnic with us and was the belle of the ball. Oh yes she was. Sheâ€™s so prim and proper and well behaved.. until those yummy ribs come out. Then sheâ€™s all of a sudden best friends with whomever has the biggest bone. Then she moves onâ€¦ and on.. and we laugh and laugh. I like to put her in the baby swings and she loves it.. and then we laugh and laugh some more. Thatâ€™s it. Iâ€™m lost in my sweet puppy-doodles thoughts. 1. Finally, low temperatures and humidity! I’m a Texan born and raised but have never gotten used to the “dog days” of hot/humid summers. I’ve missed sitting on my patio and marveling at the glory of God displayed just outside my door. 3. The garden is low maintenance, it gets dark earlier, and I can focus on knitting in the evenings. Fall of this year was the best for me too. We have just recently moved to North Carolina..in the mountain area…and fall was breath taking. There were times when I was just speechless and then so many times I had to complement God on the creativity of it all. He is an incredible artist! And, I just wanted to thank you for sharing the points from the Bible study…I think I will take them and try them out. It reminds me a little of some of the things we did in my inductive Bible study in college. It brought back some good memories. I have to admit the siesta fiesta ranks pretty high on my list for the biggest blessing of my year! You were so funny! I love your sense of humor! Also, it was so great to speak with Amanda briefly; and your mom brought a mighty good Word to us! And of course meeting all my siestas was the icing on the cake! This fall we have welcomed two beautiful blessings to Mission Raleigh! Little Littia Ruth born in October and Iona Christine born November 1st are just precious! I love being Mission Raleigh granny! I also love buying girl clothes! And of course what would fall be without doing a Mama Beth Bible study! Keep us updated on what’s going on with you! 1) Doing the James Macdonald study “Lord change my attitude before its too late” It was some of the best practical teaching I have ever heard. 3)Surviving 7th grade with my daughter! Well we moved from NY to VA, started school back up (we home school). Hubby started a new job, and I am still trying to go through boxes. Working through Having a Mary Heart in a Martha World,that is a super study. Really makes you look at your relationship with the Lord. I love fall and the colors, smells, baking the whole fall experience. 1. Last night for “A Woman’s Heart”..it’s been great! 2. Spending week with newborn grandson in Hill Country of Texas..
3. Watching our two teenage grandsons play football. 4. Serving on Pastor search Committee. 5.Updating 100 year old home and looking forward to completion. 6.Enjoying beautiful weather, even though very little foilage in our part of the world. 7. Looking forward to family coming home for Christmas. 8. Packing “Twelve Days of Christmas” box for missionary family. 9. Excited about first fire in fireplace and homemade soup. 10. Rejoicing in who God is in my life and in the lives of friends and family. You had a great top 10 list. You are amazing. I just read the foreward you wrote for Mom’s Esther study and was awed and inspired by you. Here’s a few highlights of 2008. 1. Welcomed my 4th grandchild and 2nd granddaughter, little Mercie into the world in February. What joy! 2. Finished teaching “Stepping Up” and was truly humbled and at the same time so thankful to my Lord that He grew me spiritually and put me on a higher plain. 3. My husband and I both participated in a “Walk to Emmaus” and were truly changed by our experiences. 4. Just being thankful that my children are all Christians and that my 2 daughters that are married with children are raising their kids to love Jesus! As a parent there is nothing better than that. 5. Anxiously waiting to welcome grandchild #5 – a precious little boy – into the world around the first of April. 6. 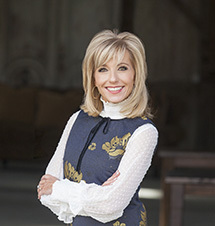 Traveling to Shreveport in August to go see Beth Moore (simulcast) with my mom! Hallelujah! It was fantastic. 7. Falling more in love with Jesus and not being able to get enough of His Word. Thank you for making all of us feel so loved and special! 1. Watching my baby boy grow and change. He just turned 6 months. 2. Watching my daughter be a wonderful big sister. 3. Our wonderful new pastor. We were without one for 2 years after our beloved, long-time pastor retired. God answered the patient prayers of our church and gave us an amazing man of God. 4. The beautiful fall colors. 5. 4 friends having new babies. Good to hear from you Melissa! 1. The Totally Focused women’s conference at our church where many women dropped their shackles and chose to be free! 2. The LPL conference in Billings with my sweet sisters from church. We had such a great time and were truly blessed. 3. A wonderful visit from good friends from our home in Georgia. They came when we had 2 ft of snow! They loved it! 4. Getting a new computer that has all the keys on it…yeah! 5. DSL. What more can I say being in MT and finally getting rid of dial-up! I have missed my family and church family dearly in GA and can’t wait to see them. I miss my hugs from the grandkids so much! My bible study group is going to do the Esther study starting in January. The ladies are so excited that we’re having a pre-Esther party in a few weeks. If you’re ever near the Marietta square on Wednesday mornings, come join us. It’s an eclectic group, from 30 somethings to 70 somethings, some who believe, some who are not so sure! 1. An October 6 Birthday Extravaganza. My handsome husband went all out to make the entire weekend special. From the most beautiful yellow roses to new paintings for decor to quality time just sitting together. 2. Teaching Tuesday night Bible study to 100 something beautiful women at Long Hollow and seeing 4 of them come to know the Lord 🙂 Glory and praise be to HIS name alone!! I just love it! 3. Of course, the gorgeous turn of the leaves. It’s my personal favorite season, right up there with spring. Although, I do love them all. 4. Finishing up at Southern Seminary. Including the end of all things Hebrew 🙂 at least in the academic setting. 5. Being married for a year and a half to the God’s chosen one for me. It’s the sweetest blessing. And I love doing weekly devotions together-we are reading Love and Respect right now. *AND of course COOKING-the holidays will be so much fun! Don’t ya just love doing life together? God is gracious to us and very good! Oh Melissa! You are a Disciple Diva if I’ve ever seen one! Love IT! I’m going to do the LIT lesson just ’cause I love the Word so dog-gone much. 1. Talking to Lora O. on the phone at least once a month! WE HAVE THE BEST CONVERSATIONS. I’m telling you the ladies I met at Siesta and shared a room with blessed my soul, too. 3. NEW HAIR COLOR AND STYLE! I’ll post a pic on my blog soon. It is a fabulously fun do! I got some layers, and a darker blonde over brown winter shade. (I know.. that maybe TMI for anyone else, but I told my girls today that I have “Re-invented” Myself yet again! 4. Praying through the election! God is so amazing and what He has shown me through my face down time for this nation has been so humbling, so freeing, so… well, It has increased my faith exponentially – the book of Joel is all marked up from that journey. 5. BIRTHDAYS! I think we have the Birthday Crazies in the fall. My husband and youngest girl’s birthday are in September -(Youngest, my baby girl is 17 this year! HARD TO BELIEVE. But, ’tis true.) My eldest turned 19 years old today. I’m crossing my fingers that this week we will go get her driving permit so she will get some time behind the wheel before taking her driving test and driving herself places for a change. I know, I know… a long, long story, but our story just the same. My dad, both my brothers, my cousin and her son, and two of the women in my group had October birthdays. Another lady in my group and my cousin’s grandbaby and daughter-in-love, and my sister-in-law this month round out our fall birthday line up! 7. Corrie Ten Boom. I’m reading “The Hiding Place.” Her story truly blesses my heart. Especially how she served the women around her while she was in the hospital even when they did horrible things like wrapping their puss filled bandages around her head. She is such a warrior and such an example of God’s grace in extreme and devestating circumstances. 8. HOLIDAYS! I bought Christmas gifts for charity this weekend and am so blessed by the experience. We usually give gifts in honor of my son who passed away three years ago, but this year, I just loved shopping for children again. Not thinking of “Jay-Jay,” but instead of the children who will be opening those presents and experiencing God’s love and gift at Christmas through the outreach of our church. We are also helping my brother and his family who are having a rough go of it this holiday season. 9. PRE-EMPTY Nest Jitters! My eldest is moving to Austin either in January or next fall – just depends on how things work out for her. Art School for Photography is on her list of things to do and I am so, so excited for her. A little trepidatious as a Momma Bear as well, but truthfully – I want to see her live her dreams. I just want to see her live her dreams. My youngest will be 18 in the fall, with a year of high school left. We are examining her options and she may make a move of her own in January 2010. 10. My husband went to the Houston/Baytown area to work after Hurrican IKE and he came home… after 7 weeks, the last week of October. My fall bonus: serving on the altar ministry team at church. I’m just loving life these days. You know last fall, I was in a season of alone sorting through the changes God had brought in my life and discovering where He wanted me to focus my attention. Today! I’m serving, feeling ever closer to Him everyday and seeing Him at work in my life and my family as well as my church. God is so good and Thanks for asking! I’m a Word Diva, too. I like lots of words… but I’m working on that. Love You, Melissa. You are a transplanted Georgia Peach! Hi Melissa! I loved the boots! 1. Celebrating 2 years of marriage this past September 2nd. 2. Attended my very first Razorback football game. 3. Praying fervently over the presidential election and all of that craziness! 4. Race for the Cure in Little Rock in October and how amazingly overwhelming it is to walk with 50,000 other women! 5. Being greeted every single day with unconditional love from our slobbery puppy. 6. Cooking up Pumpkin Rolls for our churches annual Thanksgiving dinner for those in need. Mmm…so good! 7. Learning how precious life is every single day especially when you lose someone you love unexpectedly. 8. The glorious fall colors! God really out did himself in the paint department. 9. Anticipating the Christmas season and making Christmas breakfast for our family. 10. Making a ton of cotton candy for our church Trunk N Treat. What an awesome ministry! Ok I loved this post! Is it too late to leave a comment? On the off chance that I can sneak one more little thing in I just have to say, one of my top 10 is most certainly, hands down, no question, the worship music at the Siesta Fiesta. It was my first time to hear Travis and company and I will not forget it for a long time! I knew the teaching would be great, I anticipated loving the QandA with Beth and her girls, but never in a million years did I anticipate such a powerful time of song(s). I am also pleased to say that my 6th grade son doesn’t take the bus in the mornings because I am pretty sure the bus driver doesn’t play tracks 4 and 10 every morning! 1. Just finished the Deeper Still bible study. 2. Parent’s Weekend at Baylor — going to the game with daughter and the Bears won — sic ’em Bears! 3. Getting to spend some time with hubby and even doing some early Christmas shopping. 4. Birthday celebrations with family. I always enjoy reading your posts and hope you have a blessed day. Melissa, This was great. So Glad to hear that Amanda is having a new little girl in Feb. My niece is having our first in April in Reno and it is a girl as of yesterday. I make custom embroidered fabric or satin baby booties and embroider the child’s name on one sole of the bootie and the birthdate on the other sole. I would love to bless your new niece in February with a pair. Your MOM’s teaching is such a blessing to me here in the desert of So California. I would love to do this for her FIRST grand daughter, could you please let me know that information and then I will send them to the Beth Moore office for Amanda and her daughter to enjoy!! loved reading this, and can i just say i have lived here in atlanta my entire life, and this is by far the most beautiful fall we’ve had in years! top of my list right now? just started a new photography business! Thanks for the update. I love hearing all the stuff you all are up to. I am a lurker but I couldn’t help myself. My husband and I just returned from adopting our sweet baby girl from China. We are jet lagged and trying to get back to normal here but she is settling in nicely and her 2 brothers and 1 sister are in love, as are we (mom and dad). We missed the NC mountain peak of the leaves this year but what a reason to miss. PS am I allowed to post our travel blog? Good to hear from you. My favorite part of your post today was how proud you were of yourself that your sweet husband has gained ten pounds since your marriage! Ha! My husband went from a 32 waist to 36 in a matter of months! It is so much fun to play house and cook – not so much fun to gain the weight. Another favorite of mine is just the appreciation for the fall season. It is breathtaking. I have enjoyed the movie Fireproof this season as well as the book The Love Dare. I dare you read it and try it on your hubby! Wish I was young enough and close enough to take your class! 1. Having my 9 yr old daughter insist on us getting back to our family night devotional (football greatly interfered!) and hearing our kids speak their insight into scripture. Precious. 2. Being reminded by our Lord that I am a beloved child of GOD. 4. Last and most importantly: FINALLY feeling as though I’m really truly drawing near to GOD again, as well as hearing HIM and interacting with HIM again. Ah, it’s the best! Thanks for the top 10 list! 🙂 And I love that you used the term “social reciprocity” (I was a communication major as an undergrad ;)). * Watching my fabulous DH in his new pastoral role. * The healthy growth and development of two baby boys inside of me (and my own body changing! )–and just the miracle and blessing of it all. * Getting ready for those two little miracles, who should be here in about 4-6 weeks. Melissa…I loved reading you list. You asked what we have been up to? Well, at the age of 37 I decided to go to college! I am almost done with my first semester and it has been great! It is a Christian college and one of my classes is a Bible class…our text book is N.T. Wrights Simply Christian. I have enjoyed it too! I tell you what Melissa, Your mom can zip through posts like no other moma can! Bless her sweet heart! I’m glad you have a great mommy! Thanks for another informative website. Where else may just I get that kind of info written in such an ideal way? I have a mission that I am simply now working on, and I have been at the glance out for such info.